Marmite and its interior bar Spirit in the Bottle are inspired by the best of what’s fresh, the woodsy nature of our urban space, and a very good sense of humor. We do things the way we like to do them: by hand. As many components of our cuisine and cocktails as possible are seasonal, made in-house, and utilize Bruce’s stocks and broths which simmer for hours in our namesake 40 gallon marmite (a classic French cooking pot). Opened in December of 2016 by Bruce and Sara Naftaly – the team behind Le Gourmand and Sambar – Marmite is a delightful escape from the doldrums of life. Linger into the evening over dinner and drinks, or pop in for a quick lunch. From traditional tables to our two larger communal tables and the many bar + counter seats, at Marmite and Spirit in the Bottle your experience is your own to choose. 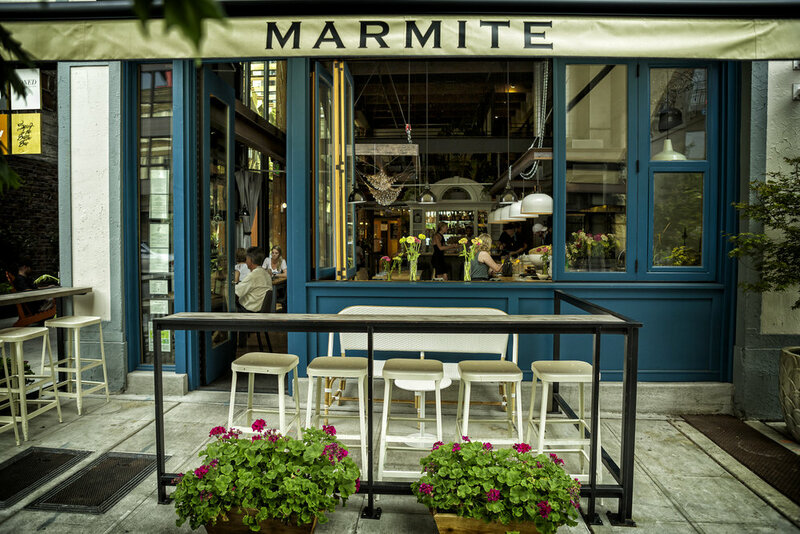 Marmite is open daily for lunch with brunch on the weekends. Dinner is served nightly except Sunday + Monday. Spirit in the Bottle, our interior bar, opens at 4pm for happy hour Tuesday through Friday and at 5pm without happy hour on Saturday. The last Sunday of most months Bruce teaches a cooking lesson at Marmite. Click here for more information, including the holiday class schedule. While we do take reservations for our dining room there is often a spot at the bar or if you’re in luck, our chef’s counter! Oh and remember! We are Marmite (pronounced mar-meat) not Marmite like the yeast spread.